Tear staining is not life-threatening, but it is a huge problem for those owners who have to deal with it. 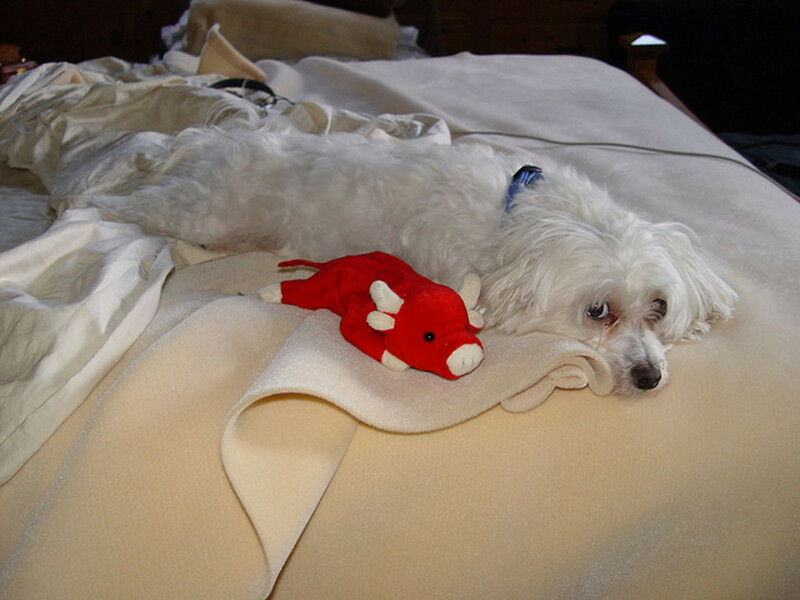 My Maltese began to show some stains around his face when he was still a puppy, and I will point out some of the methods I used to make the problem a non-issue. It is more common in some breeds than in others, but Maltese, a breed with large eyes and small tear ducts, are almost always affected. 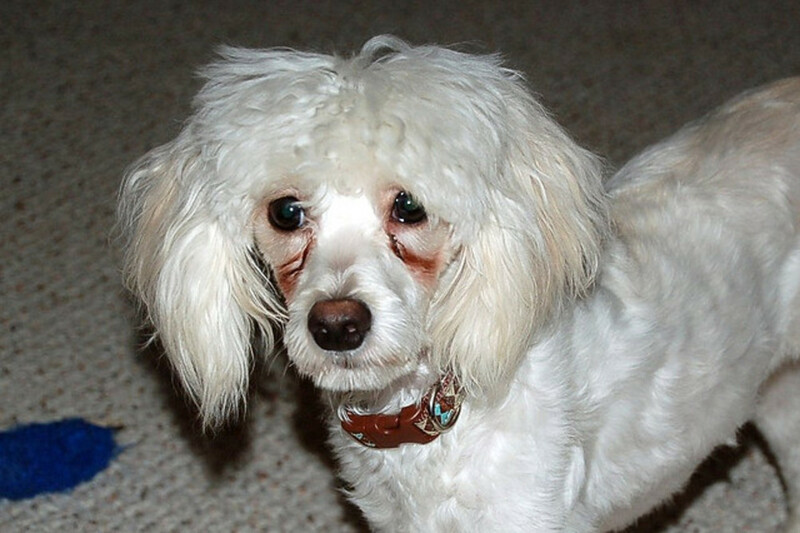 If you have a Bichon, a Poodle, or a Chihuahua, it may be a problem, too. 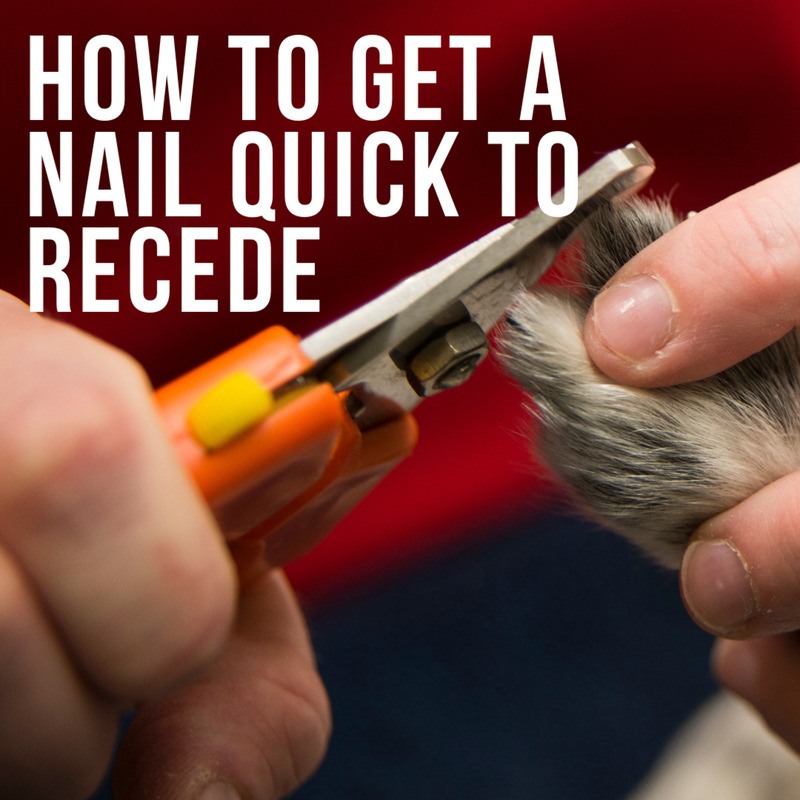 Are these methods going to work on your dog? It is impossible to say. If tear staining was a straightforward problem there would be an easy solution, something all dog owners could count on. There are a lot of solutions, just like there usually are when a problem does not have a good solution that consistently works. What Are the Causes of Tear Stains on Your Dog's Face? Allergies: Tear stains may be caused by allergies. The allergies can be to food, which is why some dog owners swear changing your dog´s diet will eliminate this problem. Diet: Dogs may also be allergic or sensitive to the dyes in some cheap foods too so changing the diet makes a lot of sense. Changing the diet does work, sometimes. Water: Tear staining may be caused by water. If the water has a high mineral content it is more likely to cause stains. You can try demineralized water, and you can also train your dog to drink from a water bottle to decrease stains around his mouth. Teething: Tear stains may be caused by teething. Since this really is a temporary problem it will go away without any treatment. Blocked tear ducts: Tear staining can be caused by blocked or tiny tear ducts. If the tears are flowing out of the eye and on top of the face the hair stays wet and your dog may develop a yeast infection, making the staining even worse. The ducts will need to be surgically repaired. Dust or smoke: Tear stains can also be caused by a dusty or smoky environment. If your dog's eyes are always red and inflamed she is going to tear excessively. The solution? Stop whatever is contaminating your dog´s house. Some people will prefer to shave the face and remove the majority of tear buildup before starting the cleaning process. To remove the stains, you can try several herbal products (like Pet Alive i-Clenz), regular saline, but I prefer cornstarch paste mixed with a little dilute hydrogen peroxide. Mix a tablespoon of peroxide and a tablespoon of water with the cornstarch until it the consistency is thick and pasty. Apply the cornstarch just under your dog´s eyes, and let it dry before washing it out. You need to be careful to apply it just under the eyes, in the stained area, and never let it get to the sensitive skin inside the eye. Peroxide can be irritating but much less so than bleach so I do never recommend you use that method. What Are the Best Natural Methods to Control Tear Stains? To prevent most stains from coming back, you can add a teaspoon of apple cider vinegar to your dog´s water. If the tear staining is caused by cheap dyes in the dog food, blocked tear ducts, or teething, this method may not help. Some stains can be prevented by changing the diet to a more natural one. Even if you are still feeding your dog commercial food, make sure it is not contaminated with dyes, chemical flavor additives, and carbohydrates. Read the label. Start giving your dog filtered (not bottled!) water. This will help in some cases, especially if the water in your tap is hard. If there is excessive smoke in your house from a fireplace, take care of that problem. You and your dogs are going to have more serious health problems than tear staining if you do not fix it. If the condition does not clear up, have your dog examined by your regular vet. There is a chance that the problem is due to very small tear ducts. Are you concerned about tear staining? Yes, my dog tears a lot. No, my dog does not have tear staining. No, I can live with it, and so can my dog. 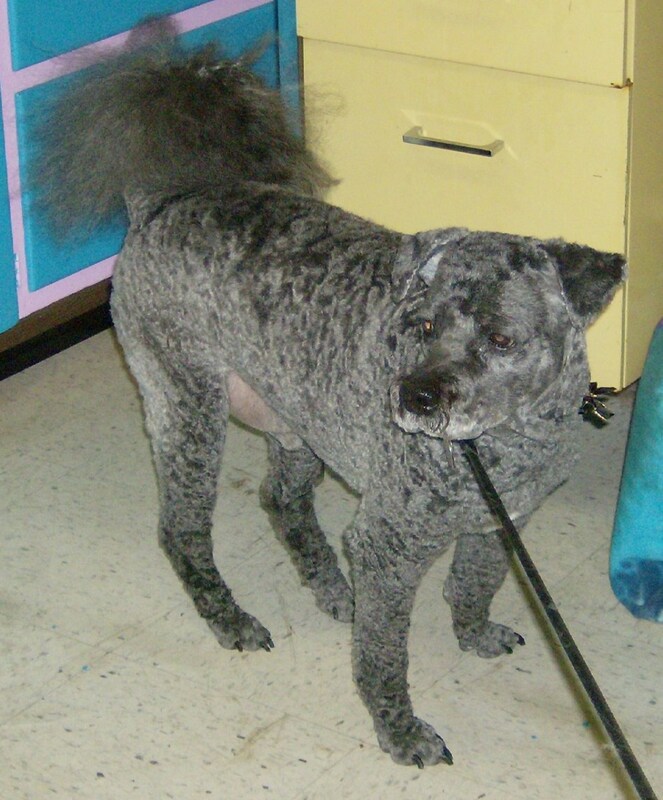 Cutting the hair around your dog´s eyes is a very temporary solution. Antibiotics may also help for a while, but unless you are using them to clear up an infection on your dog´s face I would not recommend them. Tear staining is ugly but it is not life threatening. If your dog is put on antibiotics long-term there are several serious side effects. If nothing works, learn to accept your dog. She is not a perfect piece of furniture with which you can accessorize your living room; she is a living being with potential faults. Are you so perfect? What can I use for stains around the dog's mouth? If the stains are mild, you can use the same natural cures for tear stains. If the dog drools a lot, it is not going to do a lot of good since the stains will just come right back. Is it okay to put apple cider vinegar into my Pomeranian´s distilled water? He gets urinary crystals and eats SO food. I assume that you are monitoring your Poms urine pH since he is on SO. It should be less than 7. Apple cider vinegar will also do this, so with the SO it can become too acidic. Talk to your vet about getting some pH strips so that you can monitor the urine pH at home while starting this trial, or take a urine sample every week or so to check the pH. Rita, you can try other natural therapies (like apple cider vinegar) but it is possible that your Maltese was born with small tear ducts, and the staining will not get better. 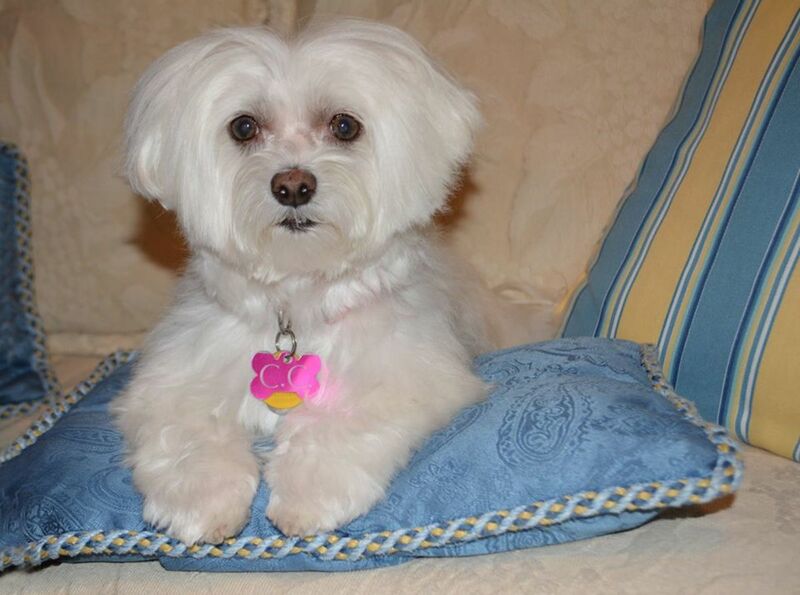 I have a 2 1/2 year old Maltese. I have tried everything to clean her tear stains and reduce the running of her eyes. I have changed food 4 times, always top quality food. I decided to make them home made food as she was a few ponds over weight. I do cook the meat and potatoes. After about 2 weeks we noticed that her eyes have completely cleared up. Four weeks later and they are still clear. I think there must be something in bought food ( very high quality food) that she is allergic to. What an amazing difference. Our other Maltese still has some running eyes. This has shown me that dogs like people may have very different allergies. She still a workin progress as we believe chicken makes her feet and ears very very ichy. P.S. 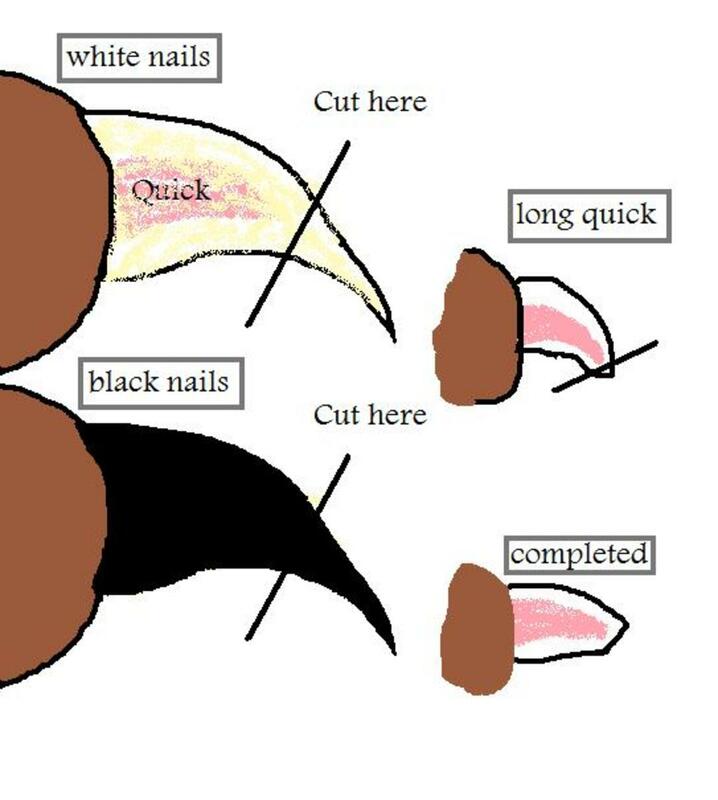 To my suggestion on tear stains. This was not a cure to tear stains, the "make-up" of Desitin or Zinc Oxide, it was more of preventative. After a nice grooming is when to start. Thir make up will also prevent the wet tears to penetrate to their fur. Like keeping a baby's bottom dry also! Try this is all else fails, or try it first, and you may not have to do all the other stuff! So easy. Thanks and kind regards, Joyce-MaMa of 5 small Poodles over the course of many years. Wishing I had another. If anyone has one in need of a good home. Let me know! I read an article that suggested giving your dog buttermilk. It works pretty good. I make tiny frozen buttermilk cubes and give her 2 per day. 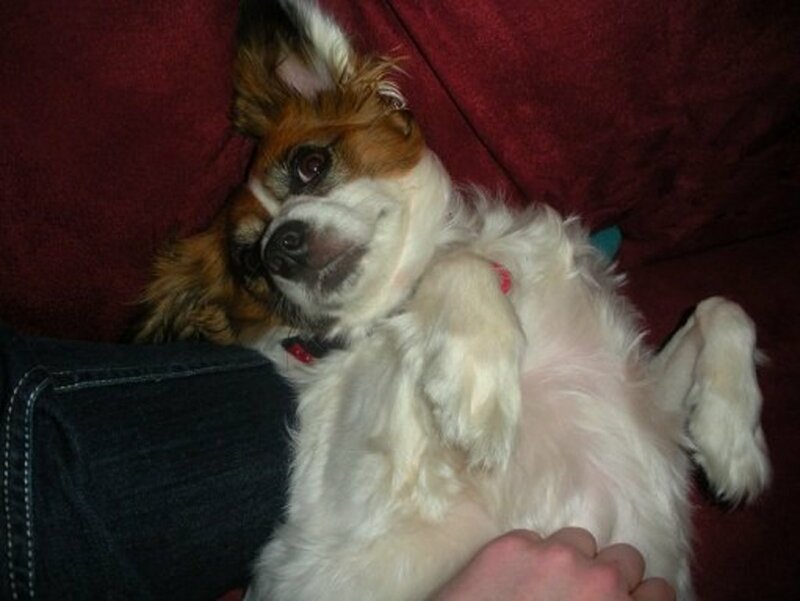 She's a havanese/maltese mix and weighs about 11 lbs. Still clean the area every morning but it is much better. We my groomer told me to only give my white schnauzer Distilled water to drink and it has worked . I was using a commercial agent for tear stains and it did not work as well. She is 5 now and we never have a problem with tear stains. My dog eat fresh meat en dont have it. There are several possible causes for the tear staining so the filtered water probably will not do any good, but if the water in Ark. is very hard a water from outside the area is worth a try. I guess if you let it get thick and crusty it would be painful, but it hardly ever gets that bad, just looks nasty. Hi Dr Mark! Good to see you again! Thanks for answering my question about tear stains in the forum. I should have known you would have a hub on the topic. I should have looked! I will try the peroxide/corn starch mix, and the ACV in the water. I have read that changing their water to filtered has helped, too. Is that true? Well, I'm going to try. Like the hub says, it's not life-threatening. It's just not attractive, and it's often wet and gets crusty. I don't know if it's uncomfortable to them? I mentioned in my response to your response (they don't give much room for an answer) that Gizmo died in January. He had tumors throughout--spleen, liver. I still miss him like crazy--probably always will. He was my "soul dog," as I've heard someone say before. 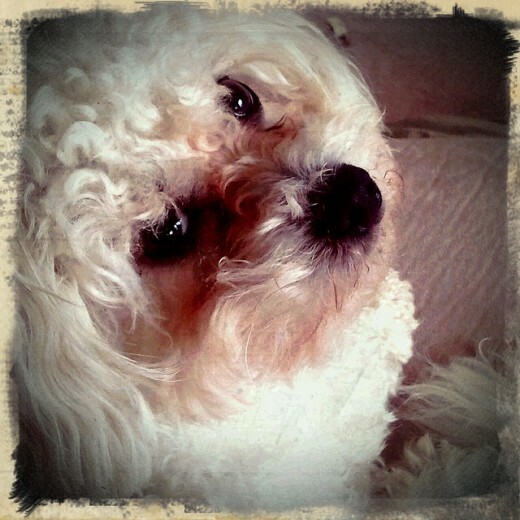 But I've rescued two more little white fluffy dogs, a 10 lb Shih Tzu mix--Audrey Rose--and an 8 lb mini poodle mix--Sissy. They're dolls and help to make the days worthwhile and enjoyable. Thanks as always for your help. I really need to go through more of your hubs for helpful information. Thank you and Happy New Year! Let me know if you have any questions that I can help with. Just leave a question on one of my hubs about homemade raw food and I will answer as soon as possible. I appreciate your interest, since one of the reasons to feed raw is to avoid all of those chemicals. Some pass right through, but the others have to be excreted somewhere, and some come out in the skin and in dark tears. It is more work than just buying a bag of dry, but if you go to a butcher and buy "parts" it is no more expensive. I buy organic chicken legs and necks, grass fed beef that humans would not eat (tracheas, etc) and many other things my dogs like. Read that article for some ideas and check out some of the great forums on how to feed raw. Your dogs will benefit from your efforts! One other question, you feed your dogs "fresh natural foods...raw chicken legs and feet, throats and esophagus from cows, etc. ", please tell this city girl where I can find these items. I've been giving my critters chicken and rice I've cooked mixed with dry dog food. Not cooking would be a time saver for sure and if it is better for my dogs that's the main concern....not that I am complaining. Hi carlynh, I would steer clear of any of the dog foods that look red like fresh meat, have "real vegetables" that are green, or otherwise colored for the humans, not the dogs. You can find the colors in the labes, Red dye No. 2, Green Dye, etc. I feed my dogs fresh natural foods (raw chicken legs and feet, throats and esophagus from cows, etc.) so I do not need to worry about any of those chemical colors in their diets. I found your information on Pinterest. Thanks for the article about tear staining. I have a question...you commented that some dog foods have cheap dyes added, what should I look out for on the dog food labeling? Thank you! Really? Did your article really just say this: "Peroxide can be irritating but much less so than bleach so I do not recommend you use that method." Hopefully watery eyes and a stained face will never be a problem with your Beagle, dogfond, but thanks for coming by and reading! My dogs never have issues with tear stains but this is definitely a good read. livewithrichard, I hope the cornstarch paste works for you. If it is a new problem, it may be diet. Consider a raw diet too and do some reading about it. There may be a chemical in the kibble that she is having a problem with. Some good advice here and I think I'll try the homemade cornstarch paste you described on our Pekinngese/ Poodle mix Daisy. Her photo is in my Hub on How to take professional pet photos. I'm thinking there was something in her diet that caused the staining. She was pure white but when we changed her brand soft to hard the stains started to appear. Thanks for the suggestions. I like the monster story! I can just imagine my kids afraid of my little Maltese. It wouldn´t be a silly topic to them; not even _n_l glands are so important. Thank your for the comments Highland Terrier and Eiddwen. Good hub, full of very useful info. Interesting and so useful ;thank you for this gem and enjoy your weekend. Au contrair (or however the French say it) I don't think it's a silly topic at all. Anything that concerns folks is worthy fodder, and I had a lot of customers who wanted to resolve the problem. 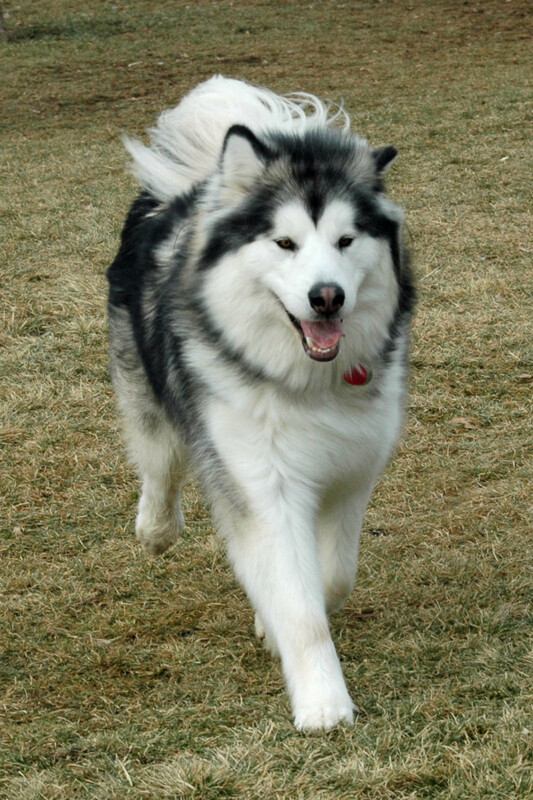 While not life-threatening, it does detract from the dog's appearance, which is a concern to many owners. I had one customer whose grandchild was terrified of his dog during advanced staining. The child thought the dog was a monster. Like most folks, he thought the beet pulp in the food caused it, and since he was hard-pressed to find a food without it, resigned himself to having a monster that scared the bejeebers out of his grandchild. We carried products that worked, to varying degrees, at eliminating the staining. One of them worked well enough to maintain this particular customer's dog at sub-monster status until the child outgrew the fear. I've learned that when it comes to people and their pets, there's no such thing as a silly topic. Yes, you are correct, all of them are caused by the porphyrin in the tears; the tear staining is always due to excessive tears or tears leaking over the face. You are probably chuckling over this silly topic! Definitely not as important as rabies, right? I didn't realize there were so many causes of staining. The only one I knew of was porphyrin in the tears and saliva. Thanks for the additional info. I don't know about your neck of the wood, but around here a common misconception is that the stains are caused by beet pulp in dog food. Most folks don't realize that the beet pulp in dog food is a by-product of sugar beets and is actually black. Great hub, very interesting info on why my older dog has tear stains. Thanks, Voted up and shared! Useful - My dog doesn't get it but it was interesting to read nonetheless.